The Twain Shall Meet: Vic Toews' 'Messy Secret' was No Secret at all ~ But he Plays the Victim. Well, this is a Riddle. There has been a huge debate over the 'recent' leaking of documents concerning Conservative MP and Minister of Public Safety, Vic Toews' divorce proceedings and the affair with his family baby-sitter as well the motivation and fallout from said divorce. It was released long ago, but some, including Mr. Toews, say that that leak demands to be investigated, some say it was already public knowledge. The info of course, was released this past week through an anonymous Twitter account, @VikiLeaks30 (now taken down) set up by a secret non-admirer of Mr. Toews. There is however a mirror site with all the content re-issued verbatim and showing all 91 Tweets. I went looking for proof that details of it had in fact already been made public and I found it reasonably easily and actually remember having read it back when it was recent news. At any rate, it is only a small reference to the affair with a family babysitter and the subsequent divorce and is contained in this article about rumours that were flying at the time over what looked to be a very suspicious Judicial Appointment for Vic Toews. It is a story worth reading. "......But the 55-year-old Toews' public face of self-righteous morality is now clashing with his troubled private life. An MP dubbed the "minister of family values" by Liberals is embroiled in a messy divorce after fathering a child last fall with a much younger woman. That's his business, frankly, yet it might explain why Mr. Toews was demoted to the Treasury Board and immediately cloaked by invisibility, stewing in question period silence while his junior parliamentary secretary juggles tough questions on election financing irregularities. But if a judicial appointment is being used to ease a problem minister out of government, it only increases the galling patronage of the appointment. And if they brazenly go ahead and hand him the $232,000-plus job and announce it in the dead of summer when nobody's looking, it will underline the optics of this government behaving no differently than any other. 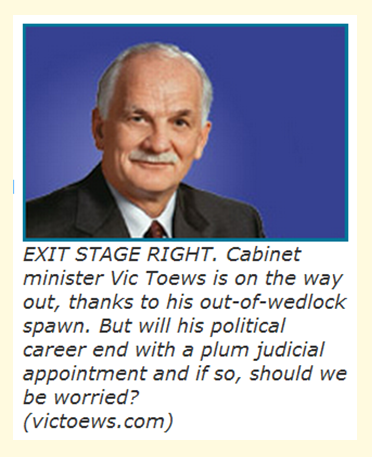 Justice Vic Toews would be a huge sign this government, even having become thoroughly Ottawashed, is still dirty. © (c) CanWest MediaWorks Publications Inc."
The riddle is this: The site offered me the opportunity to be the first to comment there. Seriously? The First? I seized that opportunity, but used it to point out that it did not seem logical that it would have gone without comment for all of these nearly four years and that given the recent furor over the problem of Bill C-30 and the even bigger problem, namely what is to be done with Vic Toews? Had no earlier comments been made? Were there comments previously that had been removed? So, now I guess we have to see why this is so. Why were their no comments? A Tweet or two might shed a bit of light on it. And oh, by the way, in case you had missed it above, the entire text of the @Vikileaks30 Tweets is still available on Twitter at a newly minted Mirror Account. Over the last few weeks I have been subjected to an extensive personal attack by my political opponents as a result of certain legislation that I have introduced in the House of Commons on behalf of the federal government. These attacks, which have included criminal acts and threats of criminal acts against me and my family, have been referred to the police for investigation. Any further criminal activity or threats of criminal activity against me or my family will also be referred to the police. As my constituents I would like you to know that the personal attacks, criminal acts and threats of future criminal acts against me will not dissuade me from carrying out my responsibilities as an elected Member of the House of Commons and as the Minister of Public Safety for Canada. The personal attacks against me are based on allegations contained in affidavits filed in the course of my divorce proceedings a number of years ago. The affidavits are on the public record and filed with the Manitoba Court of Queen’s Bench. These allegations have been the basis of prior personal attacks against me and I assume they will form the basis of attacks against me for many years to come. I want you to know that I have never responded publicly to the specific allegations made in these affidavits nor will I ever do so. I will be fully accountable for any responsibility that I bear for the breakdown of my previous marriage but that accountability is not something I owe to the public generally or to my political opponents in particular. It is a personal accountability which I cannot avoid nor do I seek to do so. However, I do want you to know that I have a spouse and a young son who I love more than life itself. No words could ever describe my love for my young son and my spouse any better. What a fortunate man I am to have them in my life. And just to set the record straight, I responded to a usually sensible blogger who has let Vic Toews off the hook ~ based it appears, solely on this somewhat soulless letter! WOW! Just when you think it is all over... This Just In! "A "gag order" written into the government's proposed Internet snooping bill makes it an offence for telecommunication companies to tell customers whether their personal information has been handed over to investigators, police or government, according to one privacy lawyer. The contentious and dense piece of legislation intends to make it easier for government and law enforcement authorities to get warrantless access to personal information of any Canadian using the Internet, under the pretence of protecting children from online predators." 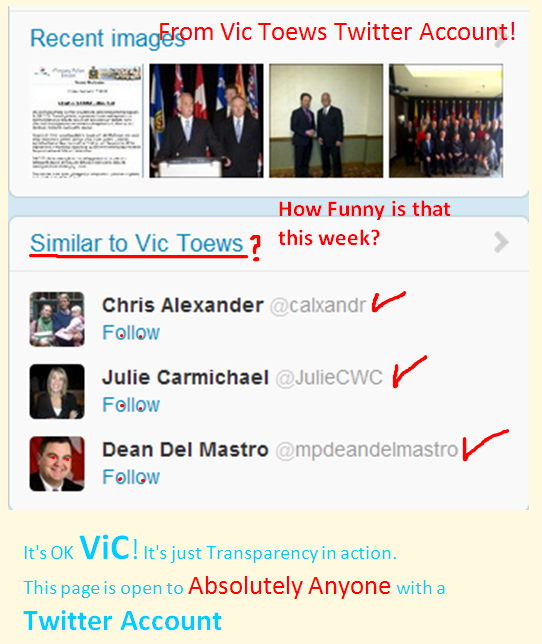 I am still wondering if Vic Toews is actually getting the message. I wonder if he knows that Twitter is a public domain open to any with an account? I wonder if he gets that it is possible to follow all of his Tweets, or address any Tweet to him or use a hash-tag to chat about him endlessly. he actually changed the name arbitrarily on a piece of legislation that he apparently never read, what are the chances that he even knows how twitter works. So, good old Vic, after taking a full day to lick his wounds and write that letter, or have it written for him, is right back on Twitter today Twittering away all by himself. All the while, people from all over the world are still addressing him over and over through his handle: @ToewsVic and using the Hash-Tag #TellVicEverything as he ignores it all and acts as if all is right in his world. It is obviously not. According to his Account: He follows 72 other accounts. And also according to Twitter, many of them Are Just Like Him, lol! Sadly that is the truth and a search of this blog using the word Amygdala will explain all of that. He is now saying that he is being threatened and the RCMP have been called in. It really never seems to stop. Old Vic in a letter to his constituents, was quoted as saying... "The other night, while I was reading my favourite poet, William Butler Yeats,..."
There seems to be no end to what the scumbags of this wonderful country are doing to it. When are we going to take action and demand they all step down? The media, being content to sit in that pan of water until it boils, is doing a disservice to their profession and to the people, that have for years, trusted them to keep them informed in a responsible way. They didn't cover Toews' divorce because it was a tawdry, private affair. If it wasn't tawdry would they have covered it? They didn't want to be seen to be seen as tabloid press? Here they fail in their responsibility to inform Canadians what Mr. Toews' moral fibre consisted of: a man who had an affair with either an underage (or close to it) babysitter for a length of time while he stayed in a marriage with a spouse who had no idea he was carrying on with another woman. (This was his second affair.) If that wasn't bad enough, once he impregnated the girl, he dropped his wife and children and then stopped support, both financial and parental. He stopped financial support to a family that needed it! This was all information made public by the Toews' divorce. But our media, with all their incredible sensitivities (we won't mention Helena Guergis here) deemed this was too "private" to reveal to the people. Yay media. Now these same media are shocked, yes shocked! and incensed, incensed I say! about these public details being made ... well, .. public. Fancy that. Vic Toews has made his bed. Do I feel sorry for him? No. I do have feelings of sympathy for his ex-wife who is being brought into this through no fault of her own. Her only crime was being married to this total scum bag who doesn't want public information revealed about him but wants to delve into our innermost thoughts, secrets or just the mundane day to day activities of our lives. And he wants us to trust him to not abuse his Bill that gives overwhelming power both to the RCMP and to him, the Minister. Ya. And he wonders why we are pushing back.